According to the 2014 Global Hunger Index report, 805 million people were chronically undernourished between 2012 and 2014 across the globe; however, Southeast Asia and Sub-Saharan Africa suffer most when compared to the rest of the world. What is more, undernourishment is often paired with hidden hunger or high micronutrient deficiencies that deplete overall health, but poor diet (including a calorie dense diet) is the main culprit in hidden hunger outcomes. In countries in Sub-Saharan Africa, where staples like maize, wheat, rice, and cassava are plenty, people gain few essential vitamins and minerals despite the energy they receive from those diets. Outside of the larger Western hemisphere, the effects of Vitamin A deficiency impact children under the age of five the most. Vitamin A is essential, and without it, severe visual impairment, blindness, increased risk of severe illness and death from common infections such as diarrhea and measles can occur in young children. 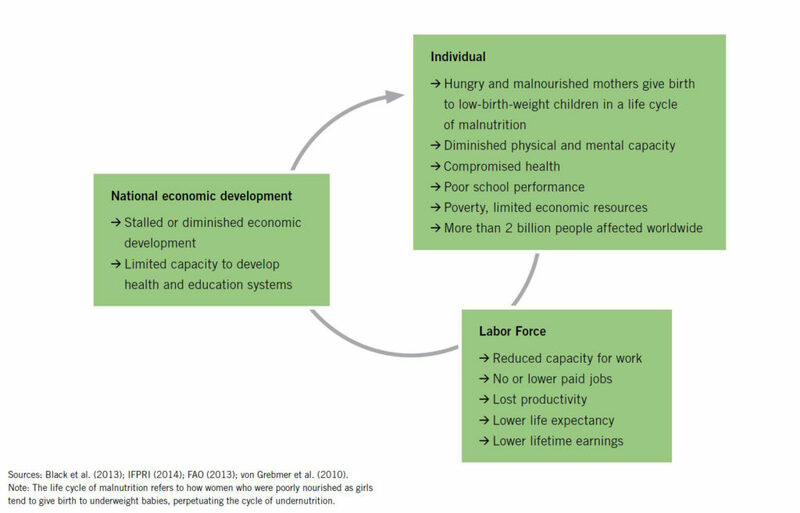 Further, hidden hunger beginning at early stages of life can create a cycle of health problems throughout a person’s life, primarily impacting the individual but also influencing the local and national economy. Poor health influences performance at school and work, which impacts overall productivity in the community and workforce. Additionally, these cycles become generational where parents pass malnutrition on to their children, and if those children are fortunate enough to survive, they ultimately pass it on to their children too. Sub-Saharan Africa has the highest prevalence of vitamin A deficiency across the globe, but eliminating this issue is possible with the consumption of more vegetables such as sweet potatoes, carrots, and dark green leafy vegetables. Research shows that while “food availability in sub-Saharan Africa has increased by nearly 12% over the past two decades, implying that more people have more food on their plates, the total number of undernourished people continues to increase.” Many countries in Sub-Saharan Africa are dealing with the “triple burden” of malnutrition, which includes energy deficiency from little food consumption, nutrient deficiencies from the lack of micronutrients in foods, and excess calorie intake that leads to obesity. To make up for these micronutrient deficiencies, GHI advertises the RAIN (Realigning Agriculture to Improve Nutrition) Project, which is working with volunteers and smallholder farmers to produce crops with high nutritional value. Nutrient-rich crops such as cowpeas, carrots, green beans, pumpkins, tomatoes, bananas, and watermelon are at the center of this project’s diverse food system. Extreme poverty in Southeast Asia impacts the amount and the kind of food the population consumes, and the area holds nearly two-thirds of the world’s malnourished children. In places like Malaysia, “about 25 per cent of children under age five are either underweight (thinner than average) or stunted (shorter than average) because of poor diets, while about 20 per cent are overweight or obese.” Low-wage income families have to make a choice about how to distribute their finances. Many times, food is not at the top of the priority list, and micronutrient-rich foods are not as affordable compared to staples like rice. Fortified foods allow for micronutrient intake while remaining affordable, but other researchers suggest adding micronutrient powders to those same foods. 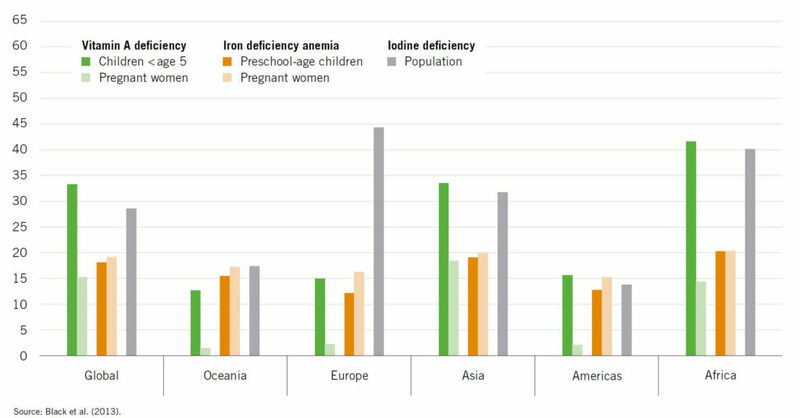 And like many micronutrient deficient areas, Southeast Asia faces anemia, especially among young people. “Half of Cambodia’s children under five and 70 percent of children under five in India” suffer from anemia, the GHI reports. As earlier mentioned, younger populations are the most vulnerable to micronutrient deficiencies, and the same is true for youth in the United States: “babies are highly vulnerable to micronutrient deficiency up to age two, when they are in a period of intense physical, motor and cognitive growth,” and making up for those nutritional losses is even more difficult later on. While the U.S. suffers from an obesity epidemic, the calories children and adults consume contain little to no nutritional value. “About 85% of Americans do not consume the US Food and Drug Administration’s recommended daily intakes of the most important vitamins and minerals necessary for proper physical and mental development,” says The Guardian. Further, many American children lack enough vitamin D and E, and need more calcium, magnesium or vitamin A. Each of these nutrients are essential in creating and maintaining a strong immune system, but also aid in preventing stunted physical growth, reduced mental ability, chronic disease and even death. Overall, hidden hunger can be prevented with a diversified diet—a balance of macro- and micronutrients—which includes cereals, legumes, fruits, vegetables, and animal-source foods. The GHI report also explains that biofortification could also provide a possible solution. With this method, farmers breed crops to increase their micronutrients like vitamin A. At the World Food Bank, we are working hard to solve the issue of hidden hunger, starting at our farm sites in Africa. By farming for crop diversity and nutritional health, we are helping farmers to understand the health and economic value of growing smaller crops of fruits and vegetables, in addition to the larger staples, like maize and corn. We are also creating a larger scale solution to hidden hunger through our upcoming initiative, the Zero Hunger Formula.